How do people enter their Keyless Entry System ID code? Press Start. The “Ready” light will come on indicating you may enter your code. Press Open to activate the door. The “Accept” light will come on if the code is accepted, if not you’ll hear a long beep. 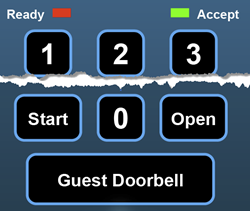 If you do not have an ID code, or have trouble getting your code to work, press Guest Doorbell to alert someone that you need assistance.